Advanced/Very Advanced on alternate Wednesdays September - March. 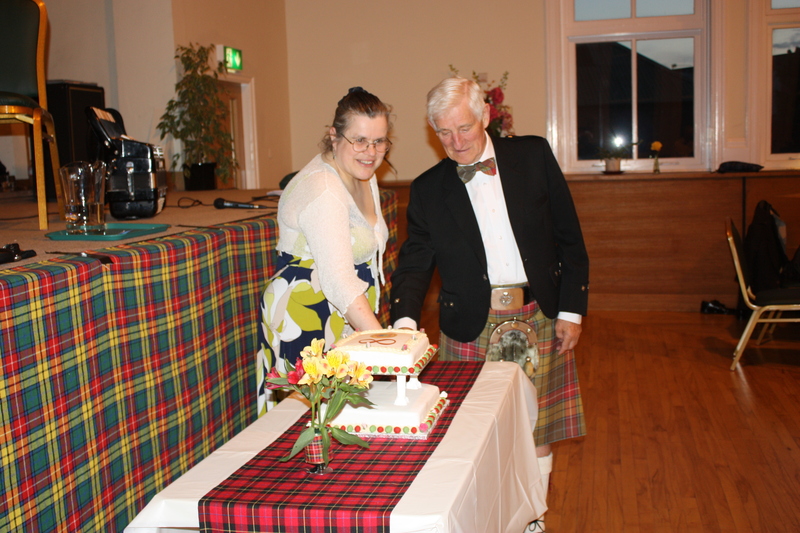 We also have two social dances per year, in November and February. The beginner's classes will help prepare you for these. Please see our Social Dances page for more details. 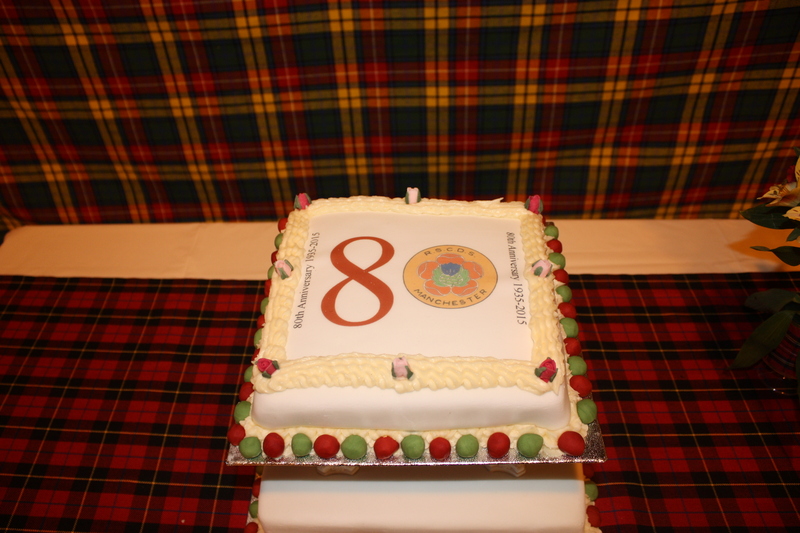 Occasionally we are able to perform demonstrations or run Ceilidhs for a small fee, subject to availability. Due to the size of the group, we request at least three months notice. More details can be found on our Displays and Demonstrations page. Scottish country dancing is a form of social or group dancing similar to ceilidh dancing, and not to be confused with Highland or other forms of "folk" dancing. Dances usually involve between 4 and 10 dancers, with each pair of dancers taking a turn in the spotlight, supported by the other dancers in the group. Dances follow patterns made up of a sequence of discrete movements called "formations". Whilst there is some footwork to be learned, the emphasis is on the patterns made around the dance hall and the fun and friendly atmosphere. Having mastered the basics, a dancer should be able to confidently participate at ceilidhs and other social dances. There are three types of Scottish Country Dancing: Jigs, Reels and Strathspeys. Jigs and reels are faster dances, whereas Strathspeys are uniquely Scottish with a very slow and sedate tempo. All three tempos are taught at our classes. The Scottish Country Dance Society was formed in Glasgow in 1923 with the aim of preserving country dances as danced in Scotland. The society recieved its "Royal" status in 1951 and has expanded to over 170 branches in the UK and worldwide. The Manchester branch was founded in 1935 and continues to hold classes and dances suitable for all levels of dancer. More about the RSCDS can be found here. Dancing is an excellent way of keeping active and reducing stress and anxiety. It is suitable for all ages, fitness and ability levels. Dancing is an ideal way of meeting people and making new friends. Scottish country dancing is also very good at improving memory as the dance form requires you to remember short sequences of dance figures, which will be repeated several times throughout the dance. Our class timetable is given below. Your first class with us is free. £6 per class thereafter, (£5 for RSCDS members, payment by cash or cheque). Prior to your first class, please email to let us know you are planning on attending. Our Beginner / Intermediate class is for adults who have never tried Scottish dancing before, or who are returning to dancing from a long break. The lessons get progressively harder each week, therefore we recommend beginners start within the first 2-3 weeks of the term and attend for the whole term. Intermediate dancers (those who have been dancing for at least a year) are also welcome to join the Beginner / Intermediate class at any time. Our Advanced / Very Advanced class is for anyone who has good knowledge of footwork and figures, and an interest in complex or unusual dances. Unfortunately we are currently unable to offer a children's class. Teenagers may attend the adult's classes provided they are accompanied by a parent or guardian for the whole lesson. Please email for more information. All our classes start at 7.30pm and last two hours with a 10 minute break halfway through. Water and squash is provided but please bring your own mug / bottle to help reduce our use of plastic. Parking for the classes is on the school playground and entry is via the playground door. Please note that local traffic can be very heavy due to football matches. It is advised that you wear ordinary loose, comfortable clothing and flat shoes or trainers to your first lesson. No heels or boots please. After 3-4 weeks of lessons, we recommend you invest in the proper shoes. Please see the Useful Links tab for more details on where to buy shoes. Below are the dates, programmes and crib sheets for our social dances. 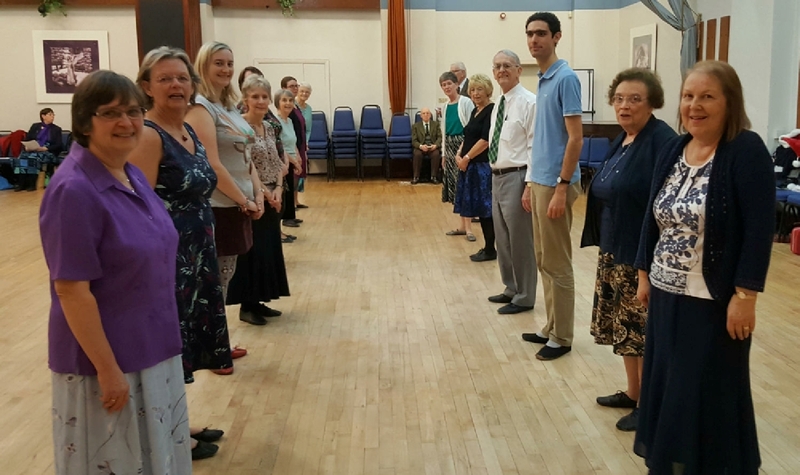 Dances for our social programmes are practiced in our Beginner/Intermediate classes in the 4-5 weeks immediately prior to the dance. Some Scottish dance experience is recommended to be able to participate fully. If you haven't danced before, or your only experience is Ceilidh dancing, please try one of our classes first. Our dances start at 7.30 pm and include a faith supper (everybody brings and shares a plate of sweet / savoury food) at the interval. Soft drinks are provided. There will also be a raffle (£1 per strip). All dances will be recapped. £8 on the door (£1 discount for RSCDS Members with valid membership card). Further details to follow. All dances will be walked-through. Suitable for Beginners. To Recorded Music. £6 on the door (£1 discount for RSCDS Members with valid membership card). Details and booking form available from the link below (External Site). Suitable for all levels. Teacher: David Queen. Our main commitment is to our own classes and dances. However, occasionally we are able to facilitate ceilidhs, or do demonstrations and displays to advertise Scottish Country Dancing for a small fee. If you wish to arrange for a demonstration or ceilidh please contact us via our email address at least three months in advance of your proposed date. Please note that since we are a small volunteer group with other comittments, it is not possible for us to facilitate events outside of evenings and weekends, or on dates which clash with our own classes and dances. For all enquiries, please email: rscds.manchester@gmail.com. We will endeavour to respond to your email within 7 days. Our venue for our classes is: Manley Park Primary School, College Road, South Manchester, M16 0AA. RSCDS Manchester is a registered charity, No. 1082107. GDPR Statement: By contacting us you agree that we may from time to time send you details of our classes and events. We will not use your details for any other purpose than this or administering your membership and will not give your details to third parties. After your first 3-4 weeks of lessons we recommend you obtain the proper shoes. Ladies wear black "ballet flats", whilst men wear "ghillies". It is strongly recommended you wear dance insoles inside your shoes since we dance on a very hard floor. For those with foot or knee problems, jazz shoes (with insoles) may be a better option to protect joints. Shoes can be obtained via the following links. Please ask in class for more advice. RSCDS Leeds Branch Shop. Please note this shop is run part-time by volunteers. Order online or at a Leeds Branch Dance. Fit To Dance, Altringham Sells a variety of shoes for all types of dance. James Senior Shoes (St Andrews, Scotland) A dedicated Scottish Country Dance shop for bespoke fittings. Scottish Country Dance Database (SCDDB) for dance cribs and videos. Scottish Country Dancing Dictionary for instructional videos on figures and footwork. RSCDS Leeds Branch Shop for CDs and books. Please note this shop is run part-time by volunteers. Order online or at a Leeds Branch Dance. Youtube has many videos of scottish dancing, including instructional videos - although video and dance quality varies. This part of the site is currently under development. Videos and pictures posted here are courtesey of our members. More photos and videos will be added as we create them. If you have pictures from our dances or classes, please let us know via our email address. Flat, lightweight shoes or trainers are ideal for your first few lessons. Do not be tempted to wear heels or heavy boots since others around you are wearing thin dance shoes and don't want to be trampled! There is no set dress code for SCD classes. However, it is advisable for you to wear comfortable clothes that you can move around in and with at least one layer you can take off easily, as you will get quite warm during the class - particularly in the winter where venues may start off quite cold. We are trying to reduce our use of single-use plastic cups, therefore your help by bringing a water bottle or reusable mug is appreciated. Water and squash are provided. You are never too old (or too young) to start. 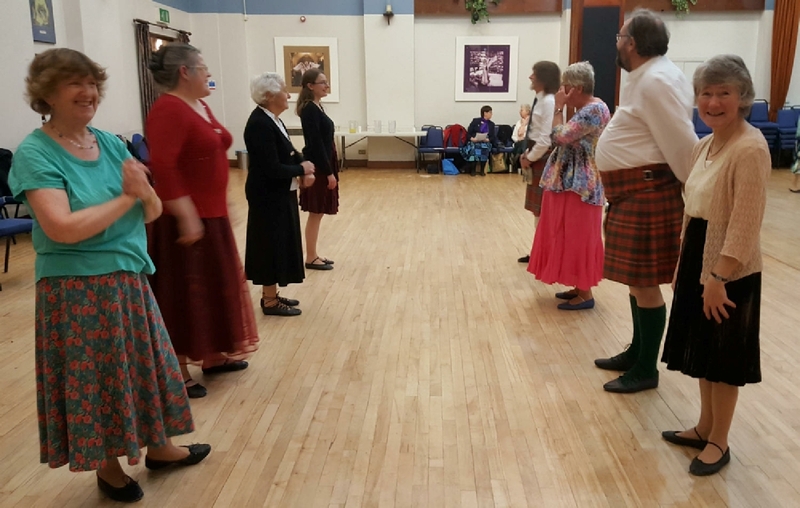 Scottish dancing has a very wide age range, with participants globally ranging from 2-3 years up to people in their 80’s and 90’s! However, RSCDS Manchester Branch are currently unable to offer a children's class. Our classes are open to complete beginners from September and January each year and those with more experience at any time. There is no requirement to start on the first class of the term/year, although to allow progression, the earlier you start and the more classes you can commit to, the better. However, if you have to miss one or two classes it isn’t disastrous. Anyone with long-term hip, knee or ankle injuries are advised to consult their GP or Physio. for general advice before starting lessons. The objective of each lesson is to learn and practice the figures/formations, footwork and dance etiquette rather than remember whole dances. Above all, the aim is to have fun and meet new people. Typical class sizes are between 8 and 24 people. Due to the nature of Scottish dancing as a form of social dance, at least 6 people are needed for a class to go ahead. If there is an odd number of people, some of the more experienced dancers will take it in turns to sit out to give other dancers a chance (and to have a well-deserved rest!) This is perfectly normal for this dance form, so please don’t feel you’ve intruded into a select group. No-one has an established/ permanent dance partner and you are expected to change partners after every dance, so everyone will get to participate. How quickly will I progress, and do I have to take exams/ enter competitions? Typically, anyone who has been dancing less than a year is considered a beginner. After which, progression is at an individual's own pace, which will depend on age, ability and enthusiasm. The majority of dancers do so for pleasure and the social aspect. As a consequence, there are no set exams and few competitions, but please feel free to discuss personal goals with the class teacher. 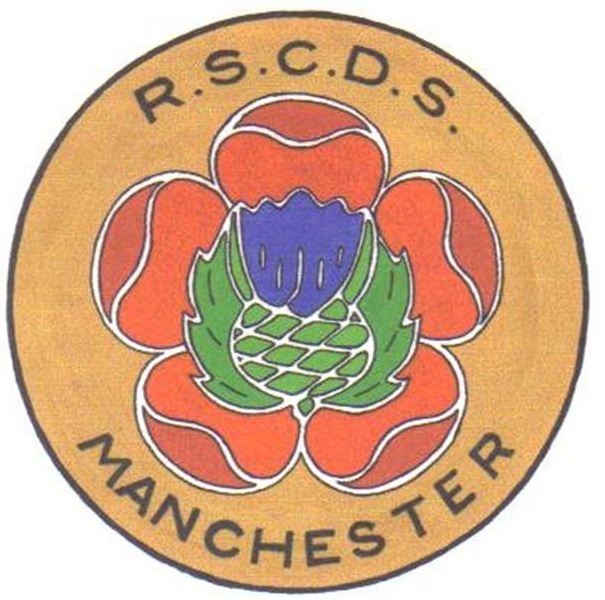 RSCDS Manchester Branch is organized, run and taught by volunteers. The committee is elected each May at our AGM by Branch members. The Advanced Class teacher is: Barbara H.
A £1 discount at all RSCDS Manchester classes (per lesson). A £1 discount at RSCDS Manchester branch dances (please provide proof of membership). Discounts at other RSCDS events elsewhere in the UK. A twice-yearly magazine subscription from the RSCDS Headquarters. A bi-monthly e-newsletter with news, updates, competitions and offers from the RSCDS. Priority booking at RSCDS Residential Schools and Events. Be part of the world's largest Scottish Country Dance network. The satisfaction of knowing that your membership makes a difference by helping preserve and revitalize an important part of Scottish culture. The membership subscription can be paid in class to our Treasurer (by Cheque or Cash). The membership fee is £25, (made up of £20 to RSCDS headquarters and £5 Manchester Branch subscription).